I know, I know. I should be working on other dramas, but just had to share this one. I wasn’t expecting much, but like most dramas of it’s kind, it’s fun and cheesy and in a good way this time. Plus, I won’t lie, I’m a sucker for vampires stories if they aren’t horribly done. 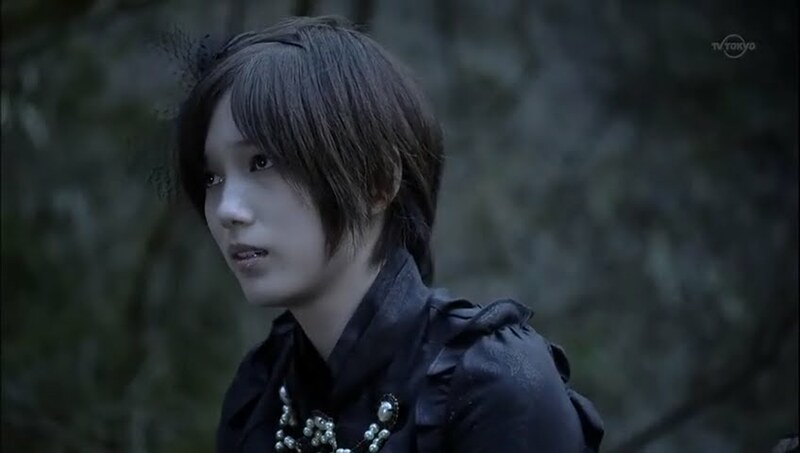 I’m also a fan of Oomasa Aya. I’ve liked her since Mei-chan no Shitsuji and Yamamato Nadeshiko Shichi Henge. 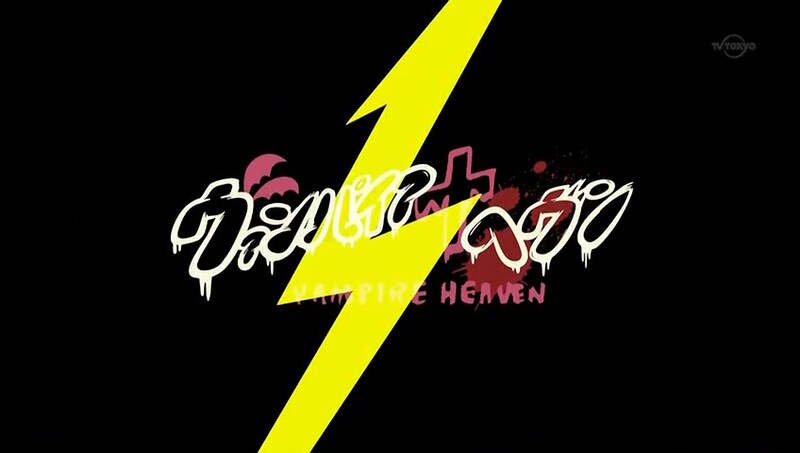 I’ve also come to like Honda Tsubasa since watching Piece. I had to laugh at the fairy tale opening of this drama. In every elementary school library there is a book about our two heroines who live in the vampire world that humans don’t know about. 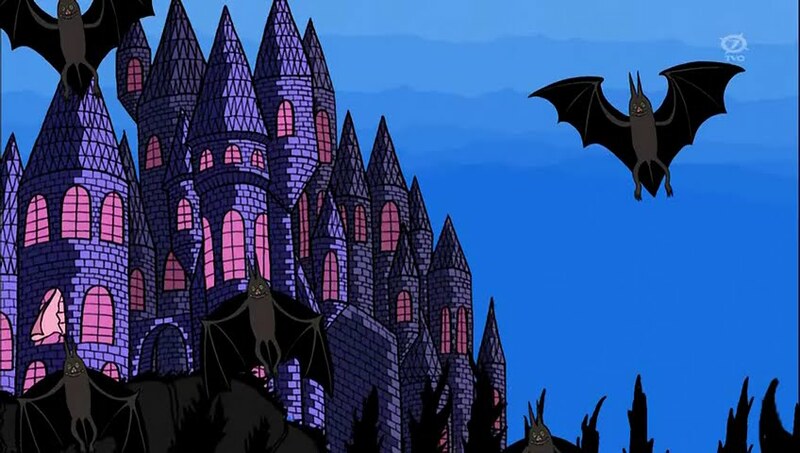 In that world there is also an evil count who does horrible things to get whatever he wants because he’s bored. Ah, nothing like a cheesy story to go with a cheesy cartoon opening. 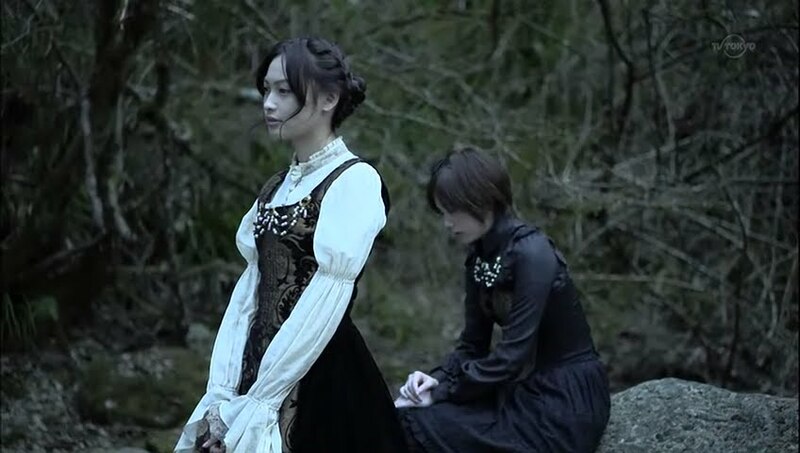 To go with the cheesy fairy tale opening, we also get a very cheesy theme song video. 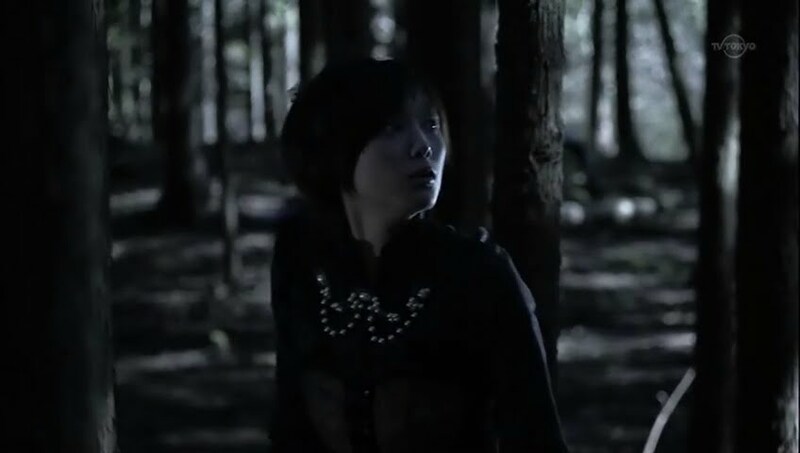 The drama opens with Sakurako (Oomasa Aya) standing pensively by a river near a forest. 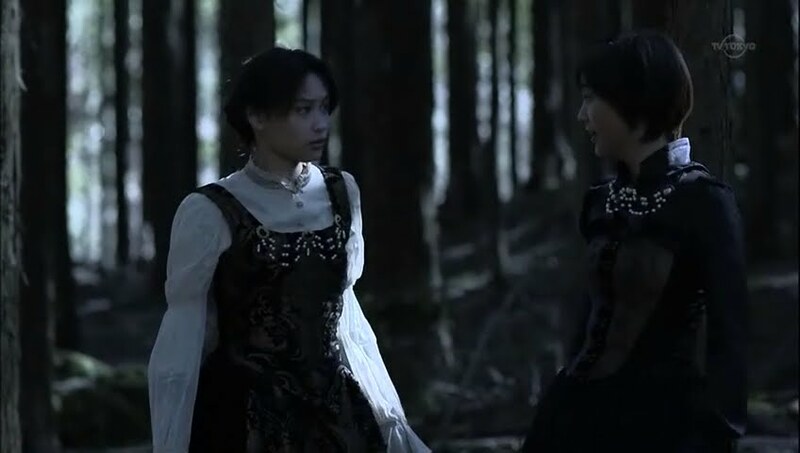 Her thoughts are interrupted by the arrival of her friend Komachi (Honda Tsubasa) who asks if Sakurako is really going to “him” (the evil count). Sakurako replies that she is and that she will be fine. Koma-chan comes nearer and says that Sakurako will not be fine at all. Sakurako replies that if she runs away another problem will occur anyways. Koma-chan won’t back down. How does Sakurako really feel about being with him? Sakurako forces a smile and sits beside her friend. 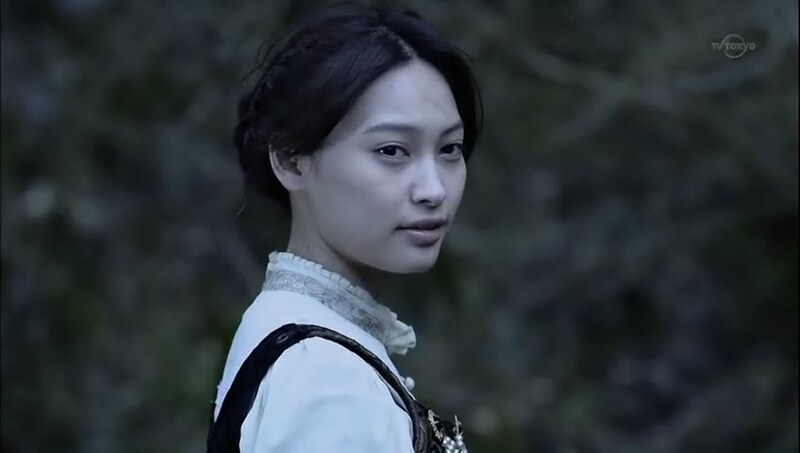 100 years or 500 years…it doesn’t matter, she will be back. Sakurako then wonders just what love is. This surprises Koma-chan. Why is Sakurako asking this all of a sudden? Sakurako says that she has heard the world changes with love. The pessimistic Koma-chan says he bet it won’t. Sakurako is then told it is time and she bids her best friend farewell. We then cut to Sakurako sitting in the Count’s house looking very uncomfortable. The Count comes and embraces her. He tries to kiss Sakurako, but she quickly turns her head away. The Count grabs her jaw and tells her not to be nervous because even though she looks like a kid, she’s been alive for 200 years already. He caresses her cheek and leans in for a kiss again. A closing door is heard and the two turn to find Koma-chan. The girl says that Sakurako forgot something important, didn’t she? Koma-chan then strides over and grabs her friend’s hand. They should hurry and get it, shouldn’t they? 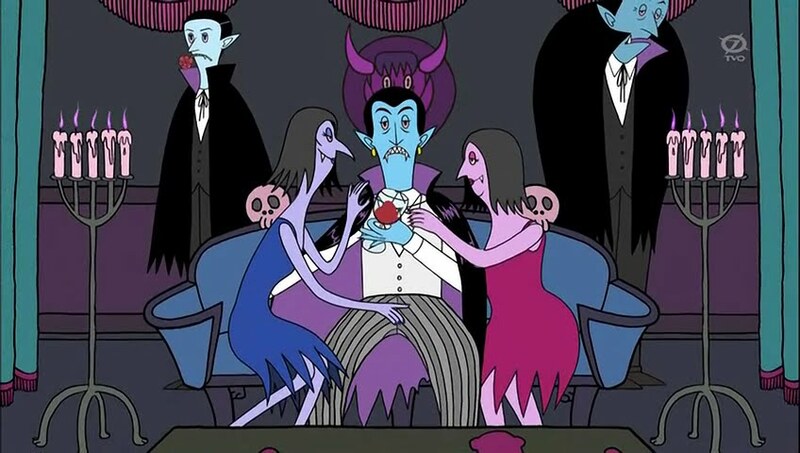 As they start to leave, the Count calls out for them to wait and tries to stop them, but the girls manage to overpower him and take off running. The Count’s men quickly rush up and ask if he is okay. 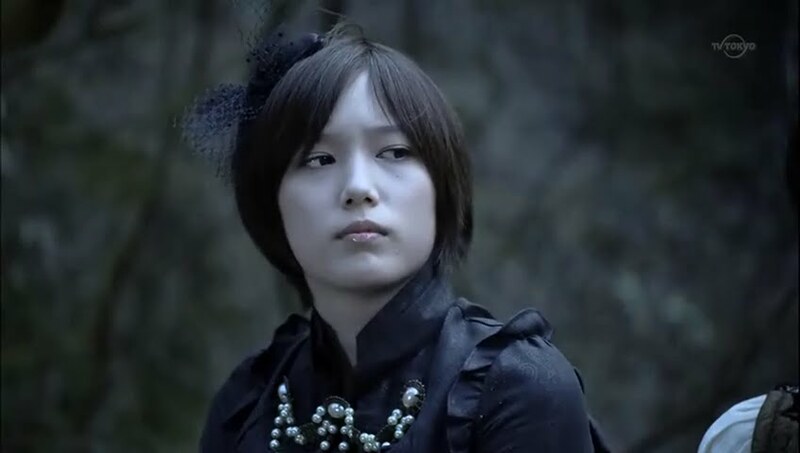 The Count replies he is fine and tells them to bring back Sakurako “alive.” The men quickly disperse to find her and we get the ironic little quip that she’s already dead. Riiiight. Sakurako wonders what they will do and Koma-chan tells her not to worry as they will figure something out. The only option might be “that.” The men soon catch up to the girls who quickly hide. After the men pass, the girls take off running again. Sakurako’s skirt gets caught and Koma-chan quickly rips the bottom off. The men discover them and the two begin running and jumping all over the place like crazy to elude them. They meet up again and Sakurako asks her friend why she came to save her. Koma-chan calmly replies it was because Sakurako had said she didn’t want to spend 1,000 years with the Count. 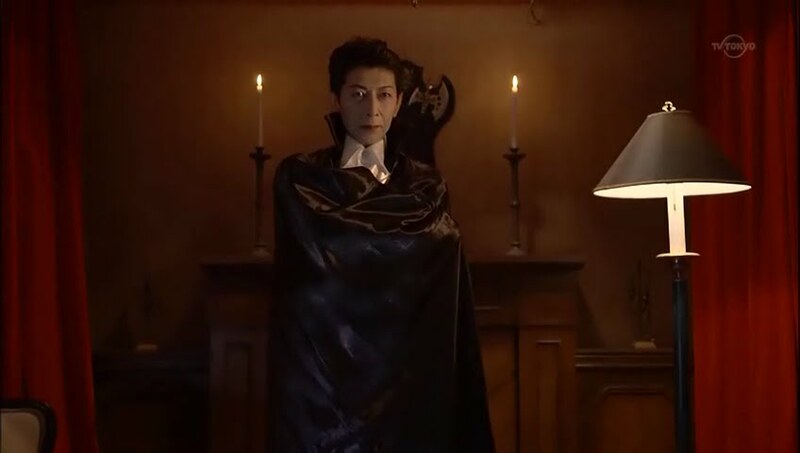 Be that as it may, the Count is still the Count… Koma-chan says that if they are caught their hearts will be staked and they will locked in a coffin for at least 400 years, thus they should get as far away as possible. Koma-chan takes off running and laughing saying it is fun while Sakurako cannot believe Koma-chan fins it amusing. When Sakurako again asks about a plan, Koma-chan’s plan is to simply run away and think about it later. The henchman catch up to the girls again and they barely manage to elude them. Sakurako thanks Koma-chan who in turn thanks Sakurako for making life interesting for the first time in about 200 hundred years. The two girls giggle as Sakurako says it will be Koma-chan’s 166th 20th birthday soon. They get to a cliff overlooking the human world and decide to dive in to elude the count and his men. One in the human world, the girls are in awe of how much it has changed. Everything is new and exciting. Sakurako is worried that they will be discovered by the masses of humans surrounding them, but Koma-chan could care less. She’s still having fun. Two high school girls then snap the vampire’s pictures. This angers Koma-chan, but Sakurako pulls her friend away. The girls did notice that they didn’t capture our vampires on camera. Sakurako wonders what they should do now that they are with the humans. Koma-chan glibly replies that they need to have as much fun as possible by pretending to be humans until the humans find out. Sakurako isn’t happy with Koma-chan’s devil-may-care attitude or the fact that her friend talked about sucking the humans’ blood. She wonders if they will be okay. Koma-chan says they should be fine as the vampires pursuing them wouldn’t dare come into a world full of humans, would they? They then run into to police officers with evil smiles who tell them its time to go home as its dangerous for women at this time of night. Recognizing their pursuers, the girls take off running to elude capture and get separated. Koma-chan ends up in the middle of a road where she almost gets hit by a car. It stops in time and she slaps the hood and asks the drive to let her ride, too. This shocks the driver, but he does let her get in and drives off with her. Meanwhile, Sakurako ends up cornered in a back alley. She says her friend’s name in worry, but when the older vampire gets to where she was, he runs into a dead end with no Sakurako while the younger vampire finds the car Koma was in. He finishes off the driver, much to the dismay of the older henchman. Sakurako had ended up in the sewer somehow. She comes up on a deserted road where she sees Koma-chan walking weakly. The two girls embrace each other happy to be reunited when Koma-chan collapses and says she is thirsty. Sakurako helps Koma-chan along and begs her to hold on. The two end up collapsing in a pile of garbage. 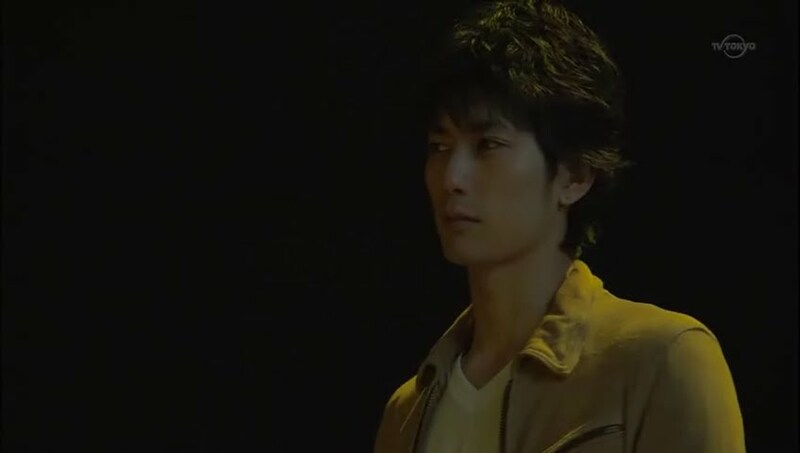 A young man (Hiraoka Yuta as Hayato) then comes by and tosses his guitar into the pile of trash. He goes to leave, but stops in surprise when he sees the two sleeping girls. He bends down and touches Sakurako’s face, jumping a bit as she moves. Sakurako weakly opens her eyes and looks at him before closing her eyes once more. 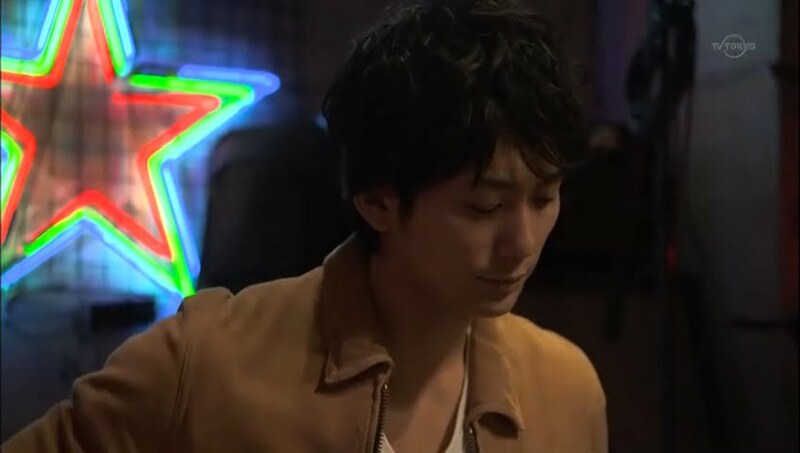 Hayato then goes to the Midnight Café which boasts that it is open from dusk until dawn. He comes in and the owner, Aoi, complains about how surly he is. He then tells her about the two girls. Aoi goes outside where she finds the girls collapses near the door. She wipes the smudges of dirt on their faces and says they made it that far. Poor girls, what to do? Back inside, Aoi serves pizza to a trio of girls who are all giggly. One girl, Risa, is commented on her weight loss. It must be the transformative power of love. They other two tell her to quickly go over as the guy she likes is looking their way. 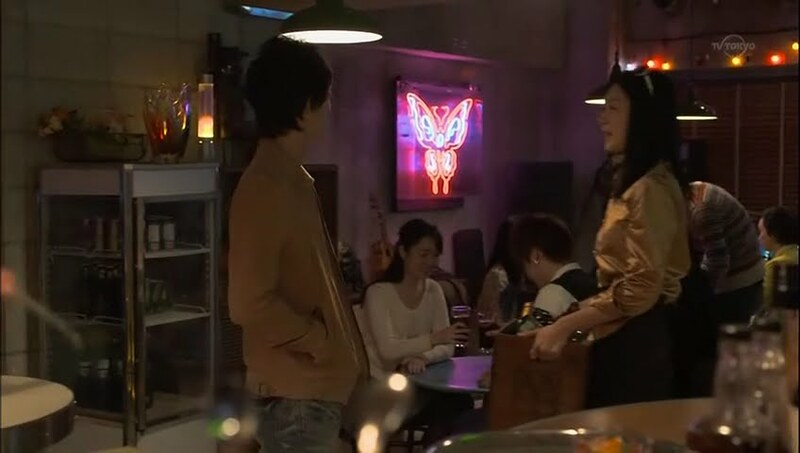 Risa gets up and goes over to talk to Hayato who is playing with a guitar which he plans on using from now on. Risa mentions papa and Hayato stops being sociable, so Risa goes back and rejoins her friends. Meanwhile, Ken-chan shows up and asks the owner what is up. The owner tells him she has something he needs to help with. He figured as much and is not happy. So what is it today—tasting food for poison? Caring for an injured pigeon? Wait…did she really make him do stuff like that? Poor boy. Aoi says that he’s sort of close and asks for a favor regarding his room. Ken-chan follows her outside where the two girls lay. Ken-chan and Aoi get the girls upstairs and Aoi thanks him. Ken-chan says it isn’t something he should be thanked for and then asks if the girls are alive. 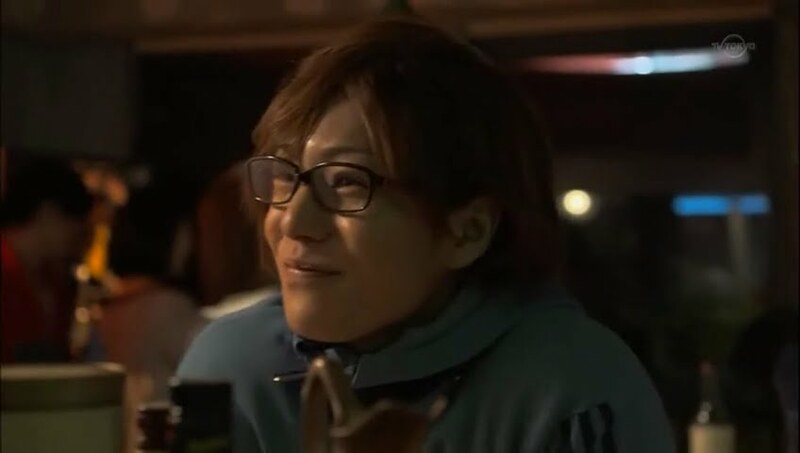 “Probably.” Ken-chan then gets excited as two adult girls and one adult guy together in a single room… Aoi wittily retorts back: “Ken-chan, where are you a guy?” Aoi then then leaves him to take care of the girls and the guitar Hayato threw out. Ken-chan isn’t happy about this, but what else can he do? He touches Sakurako’s cheek and wonders if they two are really okay since they are so cold. Later, Sakurako wakes up and wonders where they are. Koma-chan pops up and says it looks like they were brought to that boy’s room. She points at Ken-chan who is lying on the floor since the girls are using his bed. So… were they invited then? Vampires cannot enter someone’s house without an invitation. Koma-chan then puts on a happy smile—should they do it? She then crawls over Sakurako, fangs out. Just before she can strike the defenseless Ken-chan, Sakurako pulls Koma back and says it feels wrong to do so while using the boy’s bed. Koma-chan assures her that it is fine—they will take Ken-chan’s good will and his blood. Sakurako grabs Koma again and reminds her about Vampire Rule #5 (humans cannot find out the existence of vampires or else it is death). Koma wishes to break the rules, but Sakurako won’t let her. Ken-chan then gets up and the two girls fling themselves down on the bed, legs in the air. Ken-chan remarks on their sleeping habits being girls and covers them up. This gets blood on Sakurako’s hand. Where did the blood come from? Koma-chan did manage to sink her fangs into Ken-chan’s neck before Sakurako pulled her away. Sakurako tastes the blood and immediately is overcome with hunger. She starts crawling towards Ken-chan who is sitting up to study. Before she can sink her fangs into him, her hand touches the guitar. Ken-chan turns and sees Koma-chan alone on the bed. 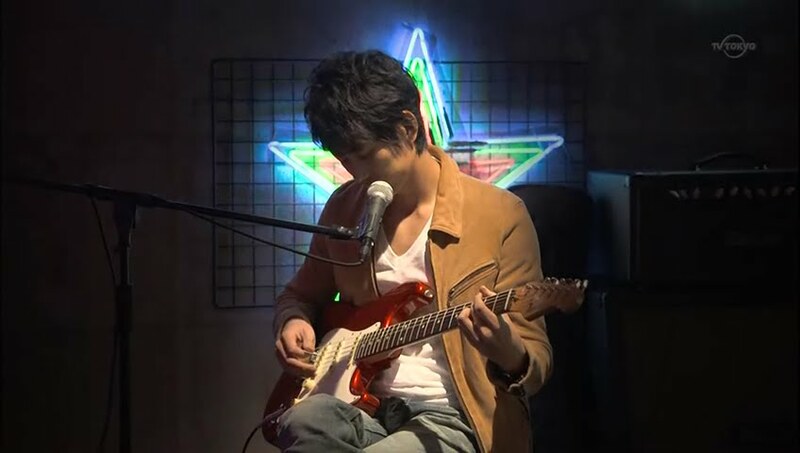 When he turns back, there is Sakurako strumming the guitar, fascinated. So the girls are awake. Koma asks about the blood, but Sakurako ignores this and urges Koma-chan to come check out the amazing guitar. Ken-chan asks if that guitar is theirs. Sakurako asks what a guitar is. What the girls are playing with. They they go back to happily plucking it’s strings. The girls then go downstairs where Aoi greets them saying they look much better. Sakurako then sees Hayajo on stage playing the electric guitar. 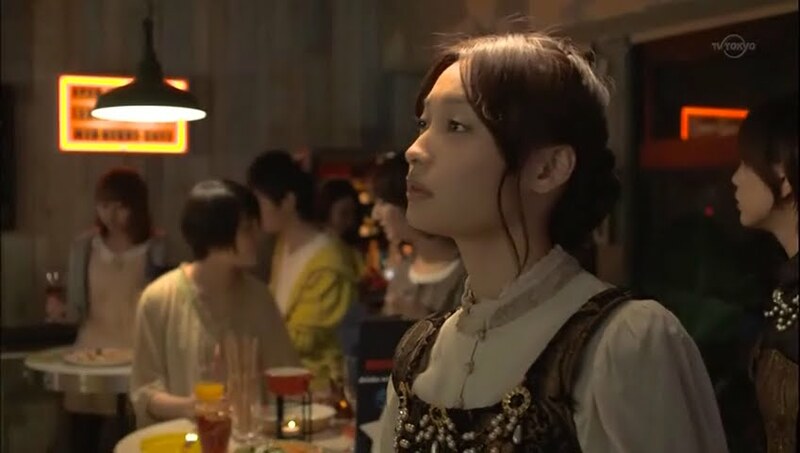 She recognizes the person and smiles broadly while Koma stares at her friend wondering what is going on. Koma glances at the direction of Sakurako’s gaze and narrows her eyes. The narrator then says that this is the beginning of a normal love story except for the first rule of vampires—they survive by drinking human blood. End episode. I’m looking forward to the hijinks of these girls as they navigate love and try to elude the Count. It’s silly and fun and a good, non-serious drama if you’re looking for a melodrama break. This is the cheesiest drama ever and I’m partially ashamed to say that I watched it. 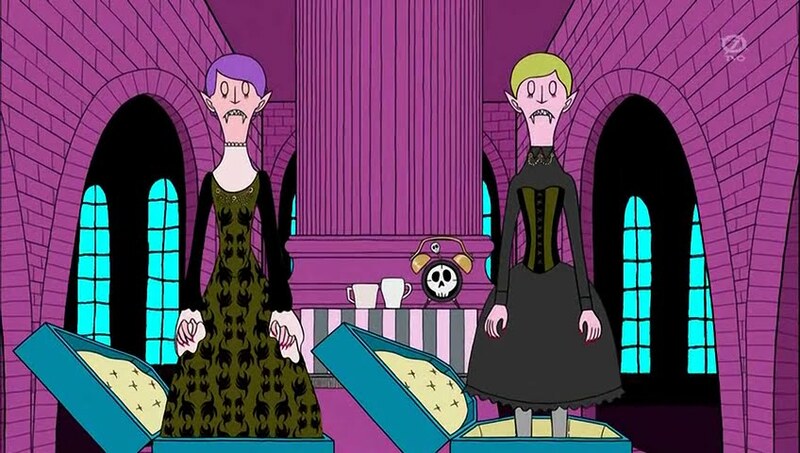 I checked out this episode and was mainly distracted by their nice costumes. O_O I thought it was funny when they were walking around in the city all oblivious that they were sticking out like a sore thumb. Although they could’ve passed off as cosplayers! I figured it would be very campy and low-budget, but was pleasantly surprised. This is my little slice of silliness that I like to watch to take a break from other, heavier dramas. it was so cute, i’m excited to see more too. 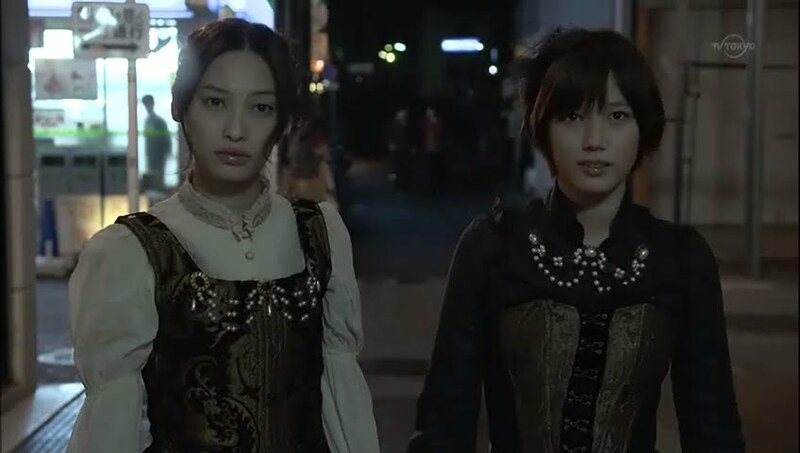 it kind of reminded me of the Yuusha Yoshihiko jdrama series a little.